SAN FRANCISCO – Lucasfilm Ltd. and Twentieth Century Fox Home Entertainment has announced the release date for “Star Wars: The Complete Saga” on Blu-ray Disc. September 12th is the international debut and September 16th is the date for North America. Each of the six Stars Wars films – Phantom Menace, Attack of the Clones, Revenge of the Sith, A New Hope, The Empire Strikes Back and Return of the Jedi – will be presented in Blu-ray high definition with 6.1 DTS Surround Sound. The comprehensive collection also features numerous deleted, extended and alternate scenes, new documentaries and a cross-section of the countless Star Wars spoofs that have appeared in pop culture over the past three decades. Marking the first time ever that the full Saga is available in one complete collection, Star Wars: The Complete Saga on Blu-ray also features a coveted peek into the making of the release with vintage documentaries, audio commentaries, behind-the-scenes moments, interviews, prop and costume turnarounds, retrospectives and more. Star Wars Episodes I-VI each get a separate Blu-ray Disc, with audio commentary by the casts, George Lucas and various LucasFilm Star Wars associates. Archival footage, insider production elements and interviews are featured on Disc Seven (for Episodes I-III) and Eight (for Episodes IV-VI). NEW! Star Warriors (2007) – Some Star Wars fans want to collect action figures…these fans want to be action figures! A tribute to the 501st Legion, a global organization of Star Wars costume enthusiasts, this insightful documentary shows how the super-fan club promotes interest in the films through charity and volunteer work at fundraisers and high-profile special events around the world. NEW! A Conversation with the Masters: The Empire Strikes Back 30 Years Later (2010) – George Lucas, Irvin Kershner, Lawrence Kasdan and John Williams look back on the making of The Empire Strikes Back in this in-depth retrospective from Lucasfilm created to help commemorate the 30th anniversary of the movie. The masters discuss and reminisce about one of the most beloved films of all time. NEW! Star Wars Spoofs (2011) – The farce is strong with this one! Enjoy a hilarious collection of Star Wars spoofs and parodies that have been created over the years, including outrageous clips from Family Guy, The Simpsons, How I Met Your Mother and more — and don’t miss “Weird Al” Yankovic’s one-of-a-kind music video tribute to The Phantom Menace! The Making of Star Wars (1977) – Learn the incredible behind-the-scenes story of how the original Star Wars movie was brought to the big screen in this fascinating documentary hosted by C-3PO and R2-D2. Includes interviews with George Lucas and appearances by Mark Hamill, Harrison Ford and Carrie Fisher. The Empire Strikes Back: SPFX (1980) – Learn the secrets of making movies in a galaxy far, far away. Hosted by Mark Hamill, this revealing documentary offers behind-the-scenes glimpses into the amazing special effects that transformed George Lucas’ vision for Star Wars and The Empire Strikes Back into reality! Classic Creatures: Return of the Jedi (1983) – Go behind the scenes — and into the costumes — as production footage from Return of the Jedi is interspersed with vintage monster movie clips in this in-depth exploration of the painstaking techniques utilized by George Lucas to create the classic creatures and characters seen in the film. Hosted and narrated by Carrie Fisher and Billie Dee Williams. Anatomy of a Dewback (1997) – See how some of the special effects in Star Wars became even more special two decades later! George Lucas explains and demonstrates how his team transformed the original dewback creatures from immovable rubber puppets (in the original 1977 release) to seemingly living, breathing creatures for the Star Wars 1997 Special Edition update. Star Wars Tech (2007) – Exploring the technical aspects of Star Wars vehicles, weapons and gadgetry, Star Wars Tech consults leading scientists in the fields of physics, prosthetics, lasers, engineering and astronomy to examine the plausibility of Star Wars technology based on science as we know it today. 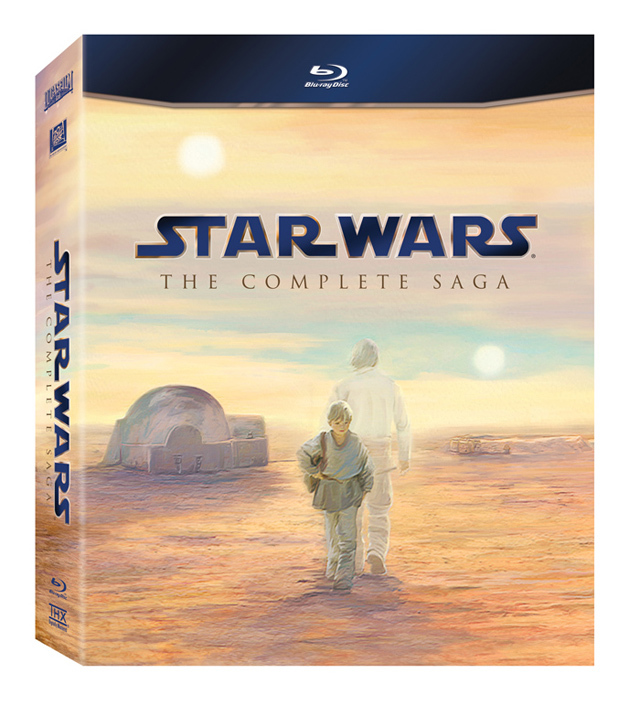 “Star Wars: The Complete Saga” on Blu-ray Disc will release on September 12th, 2011, internationally and September 16th in North America. Submitted by Anonymous3 (not verified) on May 11, 2012 - 1:16am.